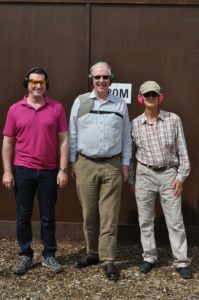 The Horners’ Company was represented at an Inter-Livery rifle shooting event held on 1st June 2018 at the National Shooting Centre, Bisley in Surrey by two Liverymen, Ralph McNeill and John Roll Pickering, and a guest, Keith Thomson. The day is organised by the Bakers’ Company and run from the RAF Target Rifle Club’s Pavilion under the supervision of very experienced coaches, including two winners of the Queen’s Prize and several other who have shot at international level. Twelve teams took part representing a total of eight Companies with two “United Livery” teams. The day began with breakfast, a general introduction and safety briefing. Then the teams dispersed to shoot the various disciplines: Target Rifle at 800 yards, Sniper Rifle at 300 yards, Gallery Rifle at 50 yards, US Civil War era Pistol at 12 yards and Target Shotgun at 20 yards. Most but not all competitors had experience at one or more of these events; none could claim expertise at all of them. A buffet lunch with non-alcoholic bucks fizz was served during a break for lunch and the day ended a short visit to the National Rifle Association’s museum, a generous tea and prize giving where much glassware was dispensed. If you would like to take part next year please contact Liveryman John Roll-Pickering.